Reading and share top 37 famous quotes and sayings about Skeptics by famous authors and people. 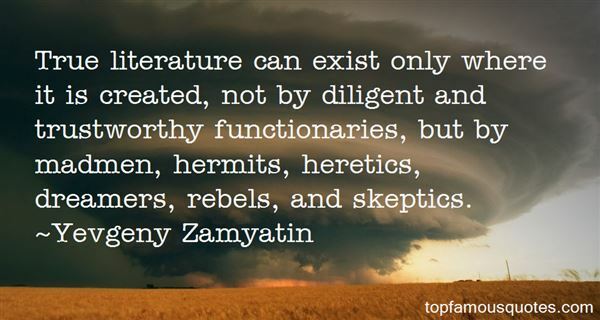 Browse top 37 famous quotes and sayings about Skeptics by most favorite authors. 1. "Belief in God and a future life makes it possible to go through life with less of stoic courage than is needed by skeptics." 2. "It is hard to see how a great man can be an atheist. Without the sustaining influence of faith in a divine power we could have little faith in ourselves. We need to feel that behind us is intelligence and love. Doubters do not achieve; skeptics do not contribute; cynics do not create. Faith is the great motive power, and no man realizes his full possibilities unless he has the deep conviction that life is eternally important, and that his work, well done, is a part of an unending plan." 3. "People are not stupid. They believe things for reasons. The last way for skeptics to get the attention of bright, curious, intelligent people is to belittle or condescend or to show arrogance toward their beliefs." 4. "Deluded or not, supporters of superstition and pseudoscience are human beings with real feelings, who, like the skeptics, are trying to figure out how the world works and what our role in it might be. Their motives are in many cases consonant with science. If their culture has not given them all the tools they need to pursue this great quest, let us temper our criticism with kindness. None of us comes fully equipped." 5. "I think that my career speaks for itself and shows the type of player I am. I have never had a teammate who didn't enjoy playing with me. There are always going to be skeptics, but chemistry will definitely not be an issue." 6. "I often ask myself, 'Who would Jesus vote for?' Then I start to think that he wouldn't vote at all; however, it would not be out of apathy or disinterest, but out of perfection and light. As a miracle worker, I think he would, by the power of God's teachings, the perseverance and the truth, influence in a modern sense whoever is put into office how to best serve his fellow men. One, like his skeptics, may find that impractical. But there is a message in that no man in power can slow the momentum of the will of God, and the miracles of his teachings will be forever victorious." 7. "Good way is to study Bible characters—take them right from the cradle to the grave. You find that skeptics often take one particular part of a man's life—say, of the life of Jacob or of David—and judge the whole by that. They say these men were queer saints; and yet God did not punish them. If you go right through these men's lives you will find that God did punish them, according to the sins they committed. A lady once said to me that she had trouble in reading the Bible, that she seemed to not feel the interest she ought. If you don't keep up your interest in one way, try another. Never think you have to read the Bible by courses. PROPER NAMES. Another interesting study is the meaning of proper names. I need hardly remark that every name in the Bible, especially Hebrew names,"
8. "The test of character posed by the gentleness of God's approach to us is especially dangerous for those formed by the ideas that dominate our modern world. We live in a culture that has, for centuries now, cultivated the idea that the skeptical person is always smarter than one who believes. You can be almost as stupid as a cabbage, as long as you doubt. The fashion of the age has identified mental sharpness with a pose, not with genuine intellectual method and character. Only a very hardy individualist or social rebel -- or one desperate for another life -- therefore stands any chance of discovering the substantiality of the spiritual life today. Today it is the skeptics who are the social conformists, though because of powerful intellectual propaganda they continue to enjoy thinking of themselves as wildly individualistic and unbearably bright." 9. "The ultimate freedom for creative groups is the freedom to experiment with new ideas. Some skeptics insist that innovation is expensive. In the long run, innovation is cheap. Mediocrity is expensive—and autonomy can be the antidote." TOM KELLEY General Manager, IDEO"
10. "Skeptics always want miracles such as stepping down from the Cross, but never the greater miracle of forgiveness." 11. "My best friends are all either bottomless skeptics or quite uncontrollable believers . . . ."
12. "To reason with the non-Christian in a fashion purporting to be independent of God or independent of reliance upon revelation is to honor the unregenerate's notions of "evidence" and "verification" as legitimate and correct. However, for the Christian, it is Scripture that governs *every* aspect of his life, even his concept of "evidence" and the way he reasons with skeptics." 13. 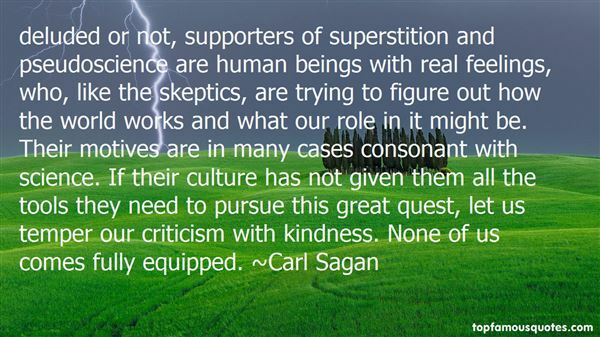 "Why is it that skeptics are always being accused of arrogance? For the record, we're the guys who DON'T claim to have absolute knowledge about the origin of the universe, the origin of life, what happens when we die, what will happen in the future, etc." 14. "My friend J. Warner Wallace is one of the most thoughtful and winsome apologists for the gospel I know. Cold-Case Christianity is literally packed with insights to share with the skeptics in your life, and this book will give you the confidence to share it!" Dr. Rick Warren, author of The Purpose-Driven Life and pastor of Saddleback Church"
15. "If skeptics were willing to give the Gospels the same 'benefit of the doubt' they are willing to give other ancient documents, the Gospels would easily pass the test of authorship." 16. "Ironically, the only people anyone believes these days are the skeptics." 17. "Within the pages and pages of crazed ruminations documented in large fonts, all caps, and eye-scorching neons, he found only a few articles of interest, mostly from skeptics. The true believers' integrity was impugned by their incompetent design skills and lack of Internet savvy." 18. "The problems of the world cannot possibly be solved by skeptics or cynics whose horizons are limited by the obvious realities. We need men who can dream of things that never were." 19. "Skeptics would rather, even at their own expense, appear to be right than take the risk of trusting." 20. 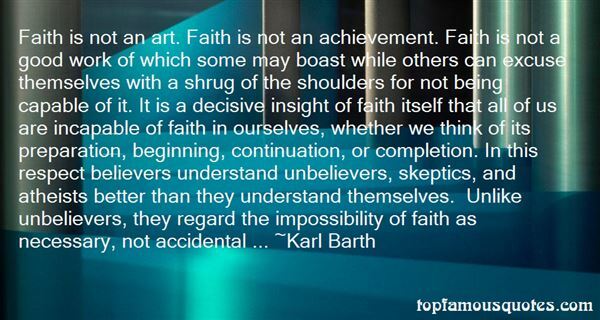 "Faith is not an art. Faith is not an achievement. Faith is not a good work of which some may boast while others can excuse themselves with a shrug of the shoulders for not being capable of it. It is a decisive insight of faith itself that all of us are incapable of faith in ourselves, whether we think of its preparation, beginning, continuation, or completion. In this respect believers understand unbelievers, skeptics, and atheists better than they understand themselves. Unlike unbelievers, they regard the impossibility of faith as necessary, not accidental ..."
21. "I do know plenty of atheists, agnostics and skeptics who have become Christians through the years. In fact, several of my friends were once strong atheists but are now committed followers of Jesus." 22. "It's possible that the reason I've never experienced a ghostly presence is that my temporal lobes aren't wired for it. It could well be that the main difference between skeptics (Susan Blackmore notwithstanding) and believers is the neural structure they were born with. But the question still remains: Are these people whose EMF-influenced brains alert them to "presences" picking up something real that the rest of us can't pick up, or are they hallucinating? Here again, we must end with the Big Shrug, a statue of which is being erected on the lawn outside my office." 23. "Conspiracy theorists of the world, believers in the hidden hands of the Rothschilds and the Masons and the Illuminati, we skeptics owe you an apology. You were right. The players may be a little different, but your basic premise is correct: The world is a rigged game." 24. "I often hear skeptics say that, if psychic behavior was real, the psychics would be playing the stock markets or the ponies. In my experience, many of them do. There is, in fact, a kind of secret level of activity in which psychics consult to major corporations and businesses. People seem embarrassed to admit this activity but it takes place, just as you'd expect it to." 25. "Scientists are skeptics. It's unfortunate that the word 'skeptic' has taken on other connotations in the culture involving nihilism and cynicism. Really, in its pure and original meaning, it's just thoughtful inquiry." 26. "In principle, skeptics are neither closed-minded nor cynical. We are curious but cautious." 27. "I take notice of those who have argued consistently for the modernisation of the E.U., but so many of the skeptics in Britain are just hostile to the whole European idea." 28. "Jesus never met a disease he could not cure, a birth defect he could not reverse, a demon he could not exorcise. But he did meet skeptics he could not convince and sinners he could not convert. Forgiveness of sins requires an act of will on the receiver's part, and some who heard Jesus' strongest words about grace and forgiveness turned away unrepentant." 29. "I have known many gods. He who denies them is as blind as he who trusts them too deeply. I seek not beyond death. It may be the blackness averred by the Nemedian skeptics, or Crom's realm of ice and cloud, or the snowy plains and vaulted halls of the Nordheimer's Valhalla. I know not, nor do I care. Let me live deep while I live; let me know the rich juices of red meat and stinging wine on my palate, the hot embrace of white arms, the mad exultation of battle when the blue blades flame and crimson, and I am content. Let teachers and philosophers brood over questions of reality and illusion. I know this: if life is illusion, then I am no less an illusion, and being thus, the illusion is real to me. I live, I burn with life, I love, I slay, and am content." 30. "If you are proven to be right a hundred times in a row,no amount of evidence will convince you that you are mistakenin the hundred-and-first case. You will be seduced byyour own apparent infallibility. Remember that all scientificexperiments are performed by human beings and the resultsare subject to human interpretation. The human mind is adelusion generator, not a window to truth. Everyone, includingskeptics, will generate delusions that match their views.That is how a normal and healthy brain works. Skeptics arenot exempt from self-delusion." 31. "Skeptics," he said, "suffer from the skeptics' disease—the problem of being right too often." 32. "Our ability to extinguish new ideas is critical to productivity and to our capacity to scale existing projects. In a team setting, the skeptics—the ones who always question ideas first rather than falling in love with them—are the white blood cells." 33. "Two diametrically opposed points of view concerning religion in the West are to bee seen among Muslims. Some consider all Westerners to be Christians, with the small Jewish minority being of course an exception, and often refer to Westerners as "those Christians" as if the West were of the Middle Ages when the Crusades were carried out and when Western civilization lived in what has been called the Age of Faith. Another group of Muslims hold the opposite view that all Westerners are materialists or agnostics and skeptics and in fact there is no religion among the Westerners. Now it is essential to insist that both of these views are false." 34. "Challenge a person's beliefs, and you challenge his dignity, standing, and power. And when those beliefs are based on nothing but faith, they are chronically fragile. No one gets upset about the belief that rocks fall down as opposed to up, because all sane people can see it with their own eyes. Not so for the belief that babies are born with original sin or that God exists in three persons or that Ali is the second-most divinely inspired man after Muhammad. When people organize their lives around these beliefs, and then learn of other people who seem to be doing just fine without them--or worse, who credibly rebut them--they are in danger of looking like fools. Since one cannot defend a belief based on faith by persuading skeptics it is true, the faithful are apt to react to unbelief with rage, and may try to eliminate that affront to everything that makes their lives meaningful." 35. "There was a danger that skeptics and opponents would misread those likelihood ratio tests as rejections of an entire class of models, which of course they were not." 36. "I've stopped caring about skeptics, but if they libel or defame me they will end up in court." 37. "True literature can exist only where it is created, not by diligent and trustworthy functionaries, but by madmen, hermits, heretics, dreamers, rebels, and skeptics." Your basic person wants to talk about material culture, internet culture. I think about God, cats, nature."